The newly renovated Petit Palais is a great-value slopeside hotel with beautiful views of the Matterhorn, in Italy's top ski resort. 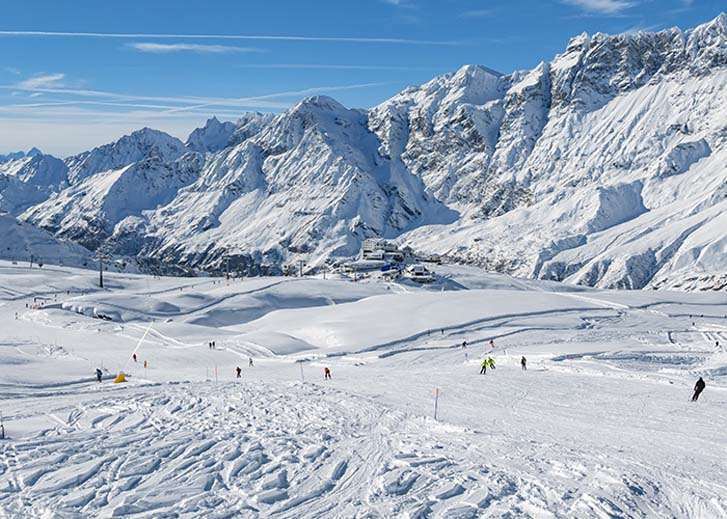 It sits at the end of Cervinia's 8km-long Ventina run and intermediates can ski almost to the door. The Plan Maison cable car is only metres from the hotel and the resort centre is a 10-minute downhill walk. For getting mountain-ready, you don't have to go far as the hire shop is located within the hotel. The Crystal exclusive Petit Palais is a popular choice for families, groups, and those looking to watch the pennies. The rooms are clean and comfortable, and have just undergone a renovation so they're stylish too. If you want to wake up to stunning views over the surrounding mountains and town, make sure you choose a room with a mountain view. The friendly and sociable bar and lounge have also got a brand new look and are just the ticket for sharing tales of your day on the mountain, or gaze out over magnificent Matterhorn views. Often hosting quiz nights, or just to play pool or a family board game, the evenings in the hotel are sure to be great fun. This excellent value half-board option is great for keeping costs down and offers home-cooked hearty meals each day. Begin with a hot and cold buffet breakfast, then round off your day with a 4-course meal accompanied by complimentary wine, water and soft drinks. All rooms have a TV and hairdryer. Twin room - sleeps 2: twin room with head-to-head beds, private shower, WC and balcony. Twin room - sleeps 2-3: twin beds, extra single bed when booked for three people, private shower and WC with mountain views. Double room - sleeps 2: double bed, private shower, WC and mountain views. This room is accessible via a private lift. Single room - sleeps 1: single bed, private shower, WC and restricted views. Quad room - sleeps 2-4: twin beds, two extra single beds when booked for three or four people, private bath, WC and restricted views. I would like to say there was no complaints on my behalf and the group i travelled with. Crystal was very helpful in looking after us whilst on the trip, it was great to see the reps come out for a drink with us also! If i could suggest anything, it would be perhaps tailoring the trip for age groups/ boarders and skiiers. The tour primarily were an older crowd and my group was mostly below 30. As a result, we did not socialise much together. A reason for going with a tour group was for social reasons too. I would rate the experience an overall 9 out of 10!